The 458 Spider will have a folding hard top instead of the canvas top offered on the 430. Ferrari has released pictures and details of its new 458 Spider, the convertible version of the stunning 458 Italia two-seat coupe. The 458 Spider replaces the 430 Spider. It will have a folding hard top instead of the canvas top offered on the 430. 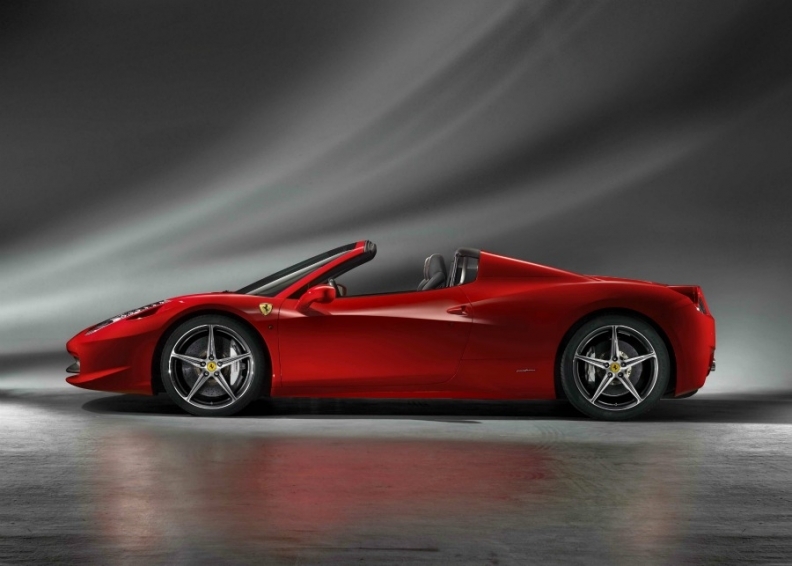 The two-seat 458 Spider will be unveiled Sept. 12 at the Frankfurt auto show. 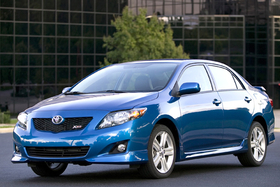 Sales in Europe begin in September; U.S. shipments follow in the first quarter. The Spider will cost more than the coupe, which in Italy starts at 197,000 euros. Ferrari customers normally pay another 15 percent to 20 percent on top of the car list price by purchasing personalization items from the company's Carrozzeria Scaglietti program. These items range from 5,760 euros for racing carbon fiber seats to 2,640 euros for a rear view camera. Ferrari says its patented, fully retractable hard top is a world first for rear engine sports cars. The aluminum top offers a number of advantages over the traditional folding soft top, including a reduction of 25 kg in weight and a deployment time of just 14 seconds. The 458 Spider has generous luggage space behind the seats. Fully integrated into the styling of the car, the hard top was engineered to fit neatly ahead of the engine bay without compromising aerodynamics or the performance of the car. Ferrari says the small space needed to house the roof enabled the designers to include a generous rear bench for luggage behind the seats. The 458 Spider's powertrain is the same as that on the 458 Italia coupe -- a normally aspirated 4.5-liter V-8 delivering 570hp coupled with a Getrag seven-speed dual-clutch transmission. 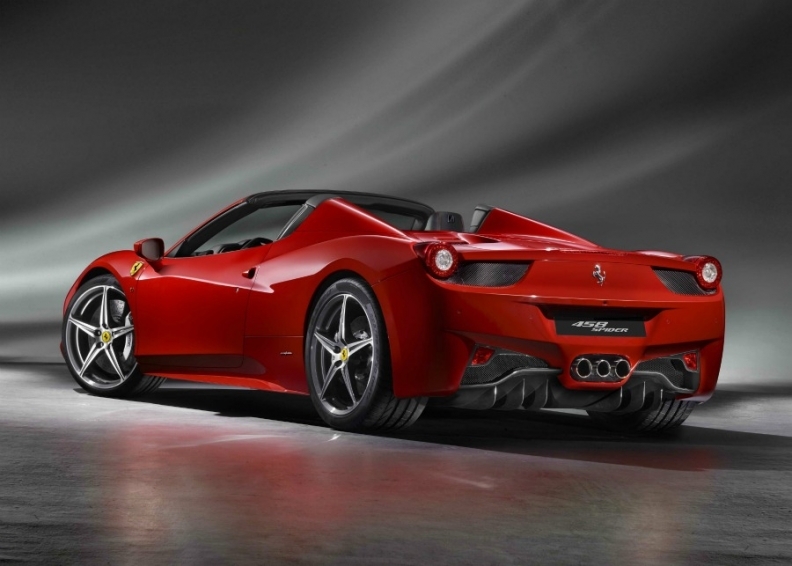 The 458 Spider accelerates from 0 to 100 km/h (62 mph) in less than 3.4 seconds. Its top speed is 320 km/h. Ferrari created a new styling for the rear of the 458 Spider, characterized by buttresses designed to optimize air flow to the engine. The car uses 11.8 liters of fuel per 100km (24 UK mpg; 20 U.S. mpg) and has CO2 emissions of 275 grams per kilometer. Ferrari created a new styling for the 458 Spider rear, characterized by innovative forms with the buttresses designed to optimize the flow of air to the engine intakes and the clutch and gearbox oil radiators. For maximum comfort whilst driving top down, the 458 Spider features a large adjustable electric wind stop, designed to enable normal conversation to be held even at speeds over 200 km/h. The 458 Spider continues Ferrari's frantic product renewal as it seeks to boost sales and remain the world most profitable automaker by operating margin (a hefty 15.8 percent of revenues last year).